Acupuncture and Scar Tissue Therapy — Amy Chitwood Burslem, LAc. It's best to treat a scar that is at least one month old to prevent infection. 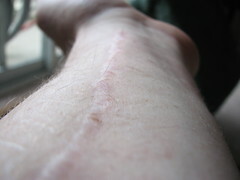 The healing process will also depend on the area of the body the scar is on, and how painful it is to touch. Often we are able to easily treat the scar with just a few needles, but sometimes it will take a little longer. Often with scars that are several years old, it will take a little longer to see results. We often use moxibustion to help with these scars. By slowly and gently heating old scars with the healing heat of moxibustion, we can gently break up adhesion and help the heal the tissue around where the body was cut. Discuss with your practitioner what you are comfortable with in terms of working on the scar. Besides the use of moxibustion or needles, they may even have you use a burn ointment to help with the healing process of new scars, such as Ching Wan Hung.